Poor little Punky is still slightly under the weather. I went over to keep Kris company as Tyler was working late tonight. I think I passed him about a block from his house. Kris and I took turns holding Alice. She was having one of her fussy nights. And the child does not take naps-she just does these little cat naps that last a half hour. It has been a long week for Kris, to say the least. I finished the quilt top for Alice. It really went together quickly. It is her colors her mother reports. Now I just have to get a backing for it. My wonderful daughter Laurie asked me if this one was from my stash and told me that at my age I really should be paring it down and not buying anything new. She just doesn't want to deal with it after I die. I told her all she had to do was contact my quilting buds and the stash would go away. 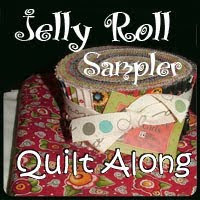 So quilting buds, you know who you are and you have been put on notice. However, I don't plan on departing any time soon and I WILL be adding to my stash. I need to keep the Moda Man happy! Stripped the bed before I went to Kris's house and Now I either need to make the bed or just pull up a quilt or two. It still is darn cold here but no snow and that is a good thing. COME ON, SPRING...I can't take much more of this cold stuff! I am working on several projects this weekend...probably won't finish any of them! Can you say A.D.D.? 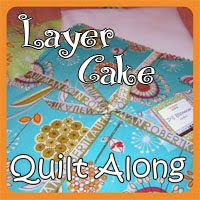 I am making another quilt for Alice out of her favorite colors. It is from March issue of Quick Quilts and is called "the modern baby". I am only to the first part. Those large blocks are wacked in half on the diagonal and then stitched back together with another wacked piece. I am also working on our swap Patches and Pinwheels. Only half a million half square triangles to construct before I start on the pinwheel part. The Moda Man is inspecting my progress as you can see. I am heading over to see Alice and Kris this afternoon. Alice is feeling better. She got sick the first week in daycare and had to stay home this week. Poor Punky-and poor Kris. First of many times with a sick baby. I didn't tell her it doesn't get easier. And now I can worry about 2 generations! So you want to come up for a return visit. I am thinking that I will need to set some rules before you set paws in my house. If you can abide by these rules, I will consider allowing you to visit MY person. Guest Blogger reports very strange happening.. This has definitely not been a good day for me. Now I know she told me that we were having a guest but I did not expect the kind of guest that arrived. She was one very strange looking cat if you ask me. She was very long and she didn't talk very much. Quite frankly, I did not care for her. I decided that it would be best if I stayed out of sight. But then she kept coming near my hiding place. Her person called her Lilly. I thought lilly was a flower but this was no flower, believe you me! The good thing is that she has gone home now. Henry told me that they call this thing a dog. He said that the last one to visit came and stayed awhile. I am glad that this Lilly dog didn't! I couldn't even get to my supper on time and boy am I hungry. Dogs drool, CATS rule!! I had to make a stop this afternoon at Toys R Us and while I was browsing the aisles, I found.....THE MODA MAN! I did not realize that he hopped into my cart until I was paying. Go figure-I don't spend enough on fabric and now I have bought his likeness? I wonder if this another one of the ways he has to get me to buy fabric. But today he was a little late as I had already been out to Sweet Home. Foiled again, Moda Man. I dropped off the pillowcases and bought some fabric for another quilt for Punky (Snugglebutt). I stopped over to see her and I stayed with her while Kris went to the supermarket. We had a good time. I told her all about her mother's early life! ...or am I just a lazy slug? I just can't seem to get myself motivated do do anything but veg on the couch in the evening. And then I end up sleeping. Did it again last night. I managed to arouse myself enough to watch CSI-NY gotta love that Gary Sinese! I really want to be productive but it isn't happening. This evening my plan is to do a little sewing before I hibernate! Once again feeling almost human.. It has been a good weekend. Saturday was Thimbles. I did not work on the quilt du jour because I was afraid I would screw it up. As it was, I did manage to make a mistake on the mystery block that I took with me. A little unsewing and it was good as new. I did have a great time being with the gals. 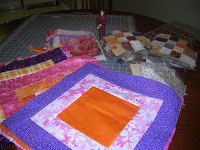 We did our swap for the Bonnie Hunter quilt and there are pictures on Becky's blog (Quilting Booklady-on my blog list). After Thimbles, I went over to Kris as I needed to see Alice. Again it was great as she is now cooing and smiling. We put her in one of her presents and she just seemed to really enjoy looking around. Tomorrow Kris goes back to work. 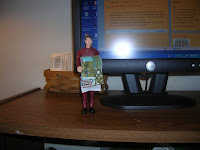 Today was command performance-Sarah needed to complete her sewing project for the try-it she is working on. Meeting is next weekend. So I got to see nearly everyone this weekend-except Laurie and LB. But I did touch base with Laur. 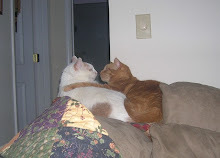 I am now home and ready to spend some quality time with the boys. Too cold to do much else...but the reindeer made it into the garage today wootwoot! !-no longer redneck decorations on my front porch! has more than one meaning. It has been a very long week but at least today won't be as bad. The training is over and the nasty people are gone. I pity the facility that gets them next week because it will be the real deal. And they are not ready. They were not even able to complete the whole process. At any rate, it is over for now/ I want to be a greeter at Walmart...no pressure! Too bad i think that a roof over my head is a necessity! The other thing that is good about today........THIMMBLES WEEKEND. Fun time with my friends and a new project (like I need a new project). I have been way to tired to do anything after work this week, so I still have no border for Carolina Crossing and Carolina Christmas still has no backing. 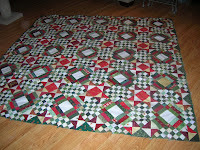 The other quilt top close to being ready has aback but it needs to be pieced. The government is phasing in a new survey process and Ga is the next state to start the process. My facility was chosen as one of the training sites and we are the lucky ones to participate in a mock survey. The old process was three days of high anxiety for all staff members. The new process that is computerized is now 5 days long. It is a nightmare. Now the fact that facilities are monitored is a good thing because the rights and care needs of the frail elderly need to be protected but this system is something else. I hope it does not mean that ultimately more good people will walk away from the profession. Because I would if I could! Only the fact that I am close to being able to retire keeps me there. If only I could afford to work at, say Mc Donalds! "Can I super size that for you? Would you like paper or plastic". Maybe a greeter at Walmart? Just kidding but now I have today and 2 more days of this madness. My plan for the weekend was to make a border for Carolina Crossing and make some pillowcases to donate. One out of two got done. I never did get to the border but I was on a roll with the pillowcases. Didn't make a dent or even a wrinkle in my stash but I did get 20 pillowcases made. If I was keeping track of fabric used I guess that would be approx. 20 yards. But the Moda Man need not worry. Bad Melisa said she is expecting a shipment!!!!! Me and the gang will be there as soon as she sends out the ;message. It seems the Moda Man has overridden my blocker. One of my goals for this year is to pare down the stash. And then I can justify visits to Bad Melisa and the Moda Man. This morning it is way too cold to venture outside. So I bundled up and went into the "vault". I am going to make some pillowcases to donate. I had to call Melisa this morning since I could not remember how she showed me to do it. 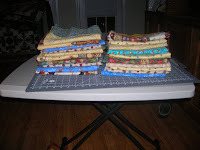 I have cut fabric to make six pillowcases. Hardly a wrinkle in what I have accumulated but it is a start. Off to sew them up! More cold and the s word.. I moved to the south in 1998 because I hated the cold and I never ever wanted to shovel snow again. The last 2 winters that I lived in NY were brutal. For the most part, since I have lived here, the winters have not been bad at all. This one is proving to be an exception. Now I know this is only the first week in January and in all likelihood by the end of next month things will be vastly different. Winter in the south is short in comparison. But right now, I am miserable. I come home and hibernate. I feel so unproductive. It is not that I don't want to do things..well maybe a little of that but I am just wanting to hunker under a quilt or three and wait for Spring. Tomorrow morning will probably be quite the adventure. There will probably be balck ice on the roads. I think I will wait until it is light to go into work. All of these tiny pieces now sewn together. I started this project sometime last year and it got put aside for awhile. I decided that I should finish this one when I started working on Carolina Christmas. It still needs it's borders and then I have to figure out backings for the both of them! I've had enought of this! I need to get these things wrapped up because there is a project coming at Thimbles and I also have the swap with Gretch et.al. on tap. Bad Melisa wrote on my facebook site that she has figured out away around my "blocking mechanism". Darn that Moda Man-I know he is behind this one. Letting Melisa take the heat-where is the gentleman in that? One would never believe that I spent most of my life north of the Mason-Dixon line. Now in my declining years, I can not tolerate the cold without whining. 2 nights ago, I put 3 quilts on the bed but found that the weight of the quilts made it hard to move. Last night I pulled the third quilt down a little so it only was on my legs and feet-much better. Henry the under the covers cat stayed close to keep warm. Hopefully this cold spell won't last too long. I always have problems in the first few weeks of the new year with the date. I wonder how many times in the next few weeks I will write 2009? I should keep a tally just for fun. I also thought about keeping a tally of fabric purchases being made. But that is probably just way too scary. Besides I am not usre how to figure out how much of already owned fabric could be deducted. I don't make resolutions anymore since I was never able to keep them. But I am going to try to whittle down some of the treasures (stash) overflowing my sewing room. 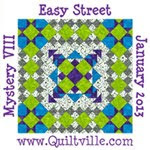 So how many quilts will be completed in 2010? To start: Christmas Lights needs a backing, my glace quilt needs to have it's backing put together...well that's a start. Too much thinking...I need some coffee to jump start the day. Gotta go to work..YUCK! But then I can come home and hibernate on the couch with the boys..something to look forward to!